Exhibition video, shot by the artist, outside Textile Center. Raging hillside blazes have become an all-too common sight in Regina Benson’s adopted Colorado Rocky Mountains. Informed by this environment around her, both in subject and process, Benson takes from her experience of nature to create textile art–on display in this arresting exhibition. A hands-on session demonstrating the changed perspectives that are spurred by hanging one’s own work on various curves. Regina Benson is an artist working in the textile medium creating wall hangings, art quilts, and dimensional textile sculptures using her own surface designed fabrics. In the last couple of years, Regina has concentrated on developing wall and ceiling-hung dimensional textile constructions that retain the painterly effects of her flat pieces, but that also incorporate physical allusions to her subjects’ aspects by mounting and embedding these works with forms and undulations. Regina Benson’s work emanates from the manipulation of and intentional mark-making on fabric, from silk and cotton to horse-hair and industrial polyesters. 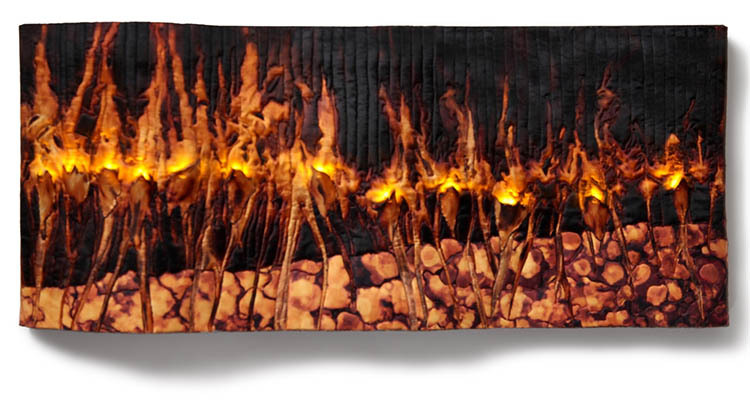 Her work frequently starts with a solid piece of black fabric, which she “discharges” (removes the base black dye) with paste or soy wax resists and Shibori techniques; then she overdyes or rusts the fabric surface many more times with natural, disperse and acid dyes to elicit additional images and textures. These initial markings are then oversewn with other textile fragments; she further free-motion stitches the work to its finish with hand-dyed threads and incorporates encaustic processes and burning to complete her vision. Regina Benson’s work has been shown in galleries and museums in The Hague in the Netherlands, San Diego, Los Angeles, Houston, Chicago and Pittsburgh. Her work has been credited with maintaining artistic integrity, technical innovation, and visual excitement. She continues to press the boundaries of contemporary textile art. Lithuanian born and primarily self-taught, Regina has lectured on the trends of textile surface design and has served as guest curator for cutting-edge fiber and textile exhibits. Recipient of Quilt National 2007 “Award of Excellence,” Regina’s work can be seen in selected exhibits and commissioned for private purchase. Select works in this exhibition were featured at the 13th International Textile Triennial in Lodz, Poland, and garnered the Jurors’ award for innovation.